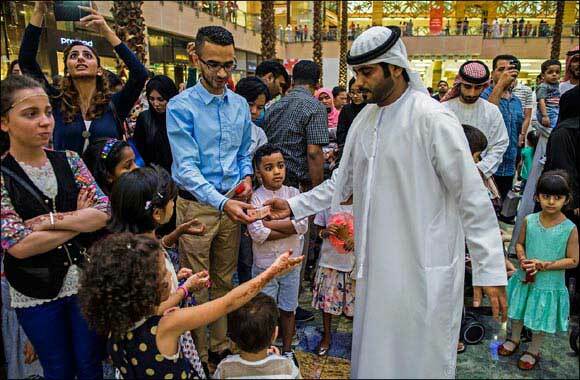 Dubai, 11 June 2018: The Hamdan Bin Mohammed Heritage Center (HHC) is promoting the generous custom of distributing Eidia or money handed to kids on the first day of Eid, marking the end of the holy month of Ramadan. Leading this event are HHC’s iconic mascots Omeir (wearing traditional kandoora) and Ghbeisha (dressed in abaya) who will be interacting with children and visitors at City Walk Dubai from 5pm to 7pm on the first day of Eid Al Fitr. The HHC will also station a white decorated van in the area and play catchy beats of traditional Emirati music to further boost the message of warm-heartedness, joy and happiness. Hind Bin Demaithan Al Qemzi, Director of Events at HHC, noted that Omeir and Ghbeisha have received warm welcome since they were first introduced to the public last month on the occasion of Hag al-Leila. “Omeir and Ghbeisha embody the values of traditions of the UAE and they impart our messages to the children, thereby nurturing a generation that is rooted to Emirati culture and society,” she underlined. Omeir and Ghbeisha will also appear in most of HHC’s future events and activities to convey the Center’s messages of safeguarding and reviving UAE’s cultural heritage.